Go on, turn the radio up and dance! I dare ya to not be happy when you are dancing. In fact I will go so far as to Double Dog Dare You! One of my favorite people, the young lady in the two pictures, is Australian Singer and Dancer (and for a brief time, a magician's assistant) Tracey Benson. Next time you're mad, try dancing out your anger. Are you looking for a speaker who is both Motivational and VERY funny? In need of a keynote speaker who blends laugh-out-loud humor with bona fide wisdom that you and your people will implement? 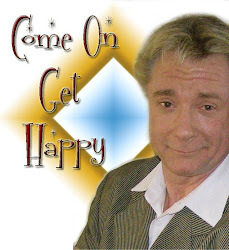 Then you want Happy Expert and Funny Motivational speaker TC Tahoe ------- TC Tahoe has brought his unique brand of Humor, Magic and Philosophy to hundreds of thousands of people around the world. TC has been dubbed “The Funniest Keep SECRET ” In the “show” Random Acts of Happy, TC will teach you what it means to live a Laugh Fulfilled Life. Random Acts of Happy will show you how to find YOUR Happy. TC will show you that not only is Happy a Choice, but it is the most import choice you will ever make. So go on, you know you want to... Be Be Happy!